Murder was never more fun and exciting for Alfred Hitchcock than in 'Dial M for Murder', a delightful chamber-piece murder mystery of sorts, now restored in its original 3D state, with those old fashioned red/blue style glasses (though modernized slightly for more comfort). Though the trauma of poor Margot Wallace (Kelly) going through an attempted murder is cause for a brief pause for reflection, Hitchcock keeps the mood light and gamely, treating murder like an intellectual chess match. Historically Dial M always seems to have gotten the short shrift compared to Hitchcock's later and more revered pictures, such as Rear Window, Vertigo and Psycho. Dial M certainly demands less of its audience than the psychologically intricacies of other films, but it more than makes up for its psychological shortage by being one of Hitchcock's most focused and thus entertaining films. 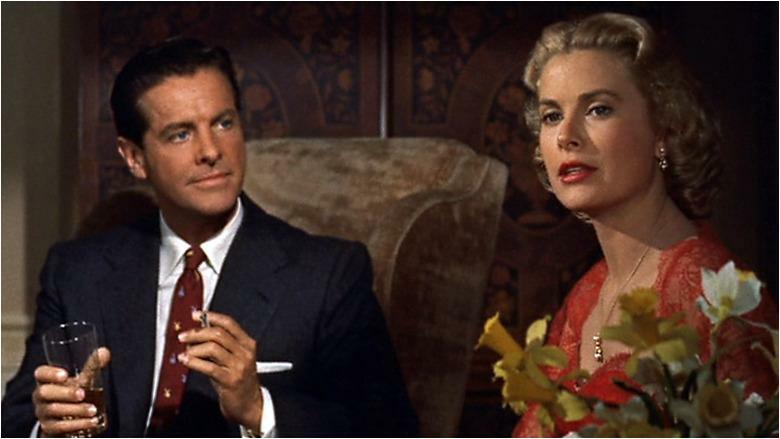 Hitch confidently has us rooting for the charming but devious Tony Wendice (Milland), a former tennis pro, long since retired but married to the well-off socialite Margot Wendice. Tony’s back story is lightly touched upon, but upon closer examination it reveals his disdain for his wife and his personal insecurities, which have driven him to the point of first degree murder. On the surface it’s Margot’s infidelity with an American writer, Mark Halliday (Cummings), but we can’t help but postulate this scheme as a long con. Perhaps Tony quietly ignored Margot on purpose, which caused her to seek the company of another man, thus indirectly giving Tony permission in his own mind to plan a murder. Tony’s plan and alibi are impressively elaborate. At first he sets up a former school mate of his, Anthony Swann, a man with a checkered past, with the ability and experience for killing but also naïve enough to be the fall guy if need be. This is all spelled out in one long carefully written and performed dialogue scene between Ray Milland and Anthony Dawson, Tony’s persuasion of Swann being utterly diabolical, nasty and Faustian in its manipulation. With the plan set and details planned out and expounded to Swann, Hitchcock sets off the Rube Goldberg chain of events, with the audience placed as spectators to Tony’s game of murder. Hitch, of course, throws in a wicked twist when Margot survives the death, causing Tony to improvise a new plan. Hitchcock’s direction of Milland is precise. Every glance and gesture in the fallout of the attempted murder is carefully shot. Milland’s thought process and reaction to every detail of evidence oozes tension and suspense. Here Hitchcock is in full command of his audience: as Tony scrambles to put together a new plan, we desperately want him to get away with it! Enter the fanciful police chief Inspector Hubbard (Williams), who has a different kind of disaffecting charm masquerading as ice cold intelligence. Hubbard’s dissection of the murder is as quietly surgical as Tony’s scheme. And in between the polite and polished game of mental chess between the Brits is the American mystery writer Halliday, who as a typical American is delightfully bullish with his methods. He backs into Tony’s alibi and accidentally unravels the case. Stylistically, the film is controlled in the usual Hitchcock fashion. Hitch, like he did with Rope and Lifeboat, voluntarily sequesters himself into one location, the Wendice apartment, finding innumerable ways to shoot the same space over and over again without the feeling of staleness. Most of the film is shot with traditional coverage, thus enhancing the effect of his unusual dramatics angles, specifically his use of the high-angle shot when relaying the geographical details of the plans. If anything, the 3D effect is underwhelming. For years watching the film in 2D I wondered how Hitch’s use of the seemingly omnipresent table lamp seen in the foreground of many of the shots would look in 3D. Sadly it’s minimal. But the greatest effect is the expansion of the depth of the space/set back into the screen. Thus, instead of objects jumping out at the audience, Hitch's 3D pushes them back into the screen. But this is now the modus operandi of today’s 3D filmmakers, once again proving Alfred Hitchcock’s position way ahead of the curve. Did you purposely use Charlize Theron's photo from Vanity Fair? Because, if so, nice touch.